The pages spread across the dining room table. 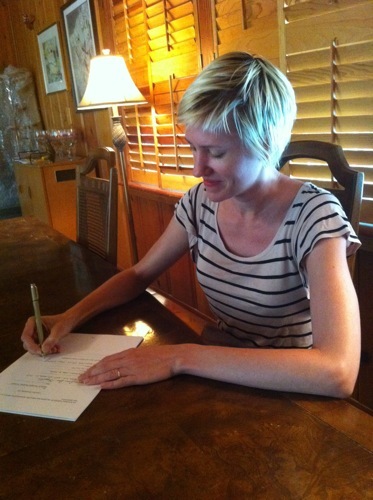 Four copies of my Flux contract for NARC, my new YA book (coming next summer). I'm so excited about this story and I can't wait to share it. Over the past few weeks, I've been working on revisions for my editor. I can already see new shapes and colors in this book--almost as if it's whispering, "This is what I want to be." In this picture, I'm sitting near my sister's paintings (just noticed that I'm signing the contracts with a Micron pen--the same I use for doodling). Sula is tickling my bare feet under the table. I've got a ton of papers to grade. Today there's only one thing I want to do. Off to the post office.